Everyone at Crystal Couture (CCI) loves crystals (including Kaylee the English Cream Retriever). 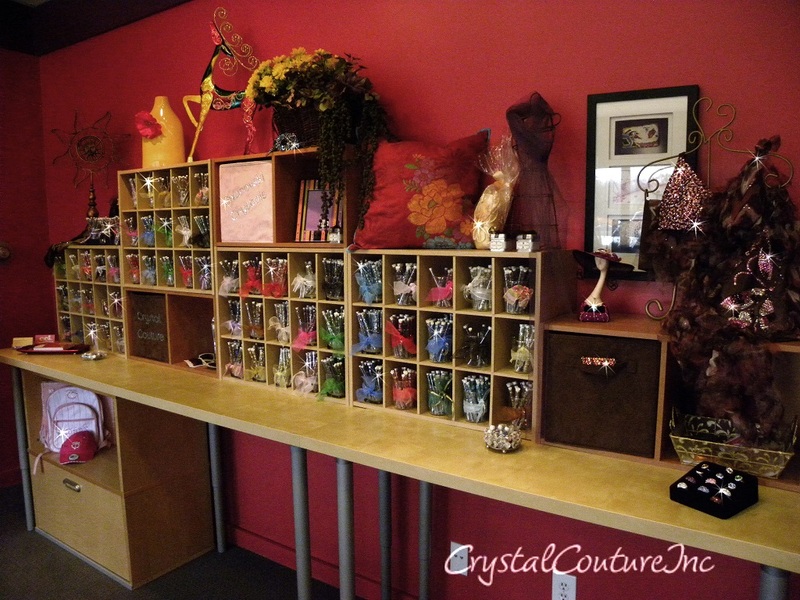 The fact that you're here, on Crystal Couture’s site, undoubtedly means that you love them too – or soon will. We are fascinated by the simple elegance and timeless beauty of Swarovski Crystals. We love the way they can make an ordinary item look extraordinary – costumes, jackets, t-shirts, iPods, cell phones, purses, key-chains, jewelry - just about anything you can imagine. If you are a first timer, we will hold your hand. If you are a veteran crystalizer, we will keep you informed on the newest products, designs and methods. If you run into a crystal crisis… we are here to help. We try to help resolve the problem quickly and provide crystal counseling if needed. We are committed to helping you achieve maximum sparkle where ever and on whatever. We ONLY sell genuine Swarovski Crystals...anything less just wouldn't be Crystal Couture! Founded in August 2005 primarily as a retail internet business, capitalizing on the trend of “make everything you possibly can...sparkle”. Teens, twentysomethings, grandma’s, moms, etc wanted to “bling” or add “gems” to their phones, jeans, t-shirts, shoes, purses, sunglasses and backpacks. CCI was one of the first companies to offer customized, Do-It-Yourself, high quality/low cost, Swarovski crystal rhinestone kits, carrying 4 different sizes of crystals in 45 colors and a set of application tools. We believe crystalizing (vs blinging) is an art. CCI set out on a mission to educate and make it easier and more affordable for consumers to buy, apply and enjoy Swarovski Crystals. Our customer base was primarily in the United States but as the trend grew, we quickly expanded internationally, currently serving customers in 18 countries. We invented and became known for our “crystals in a tube”, (a better way to organize your crystals and complete your projects), our flexibility, personal attention (have it your way), and quick delivery. In October 2009, CCI moved to a retail store front with a show room and design space located in Wayzata, MN. CCI also developed new market focused websites; expanded the product line and added a new Costume Consignment business, Encore Costume Couture. We are excited about this expansion and are poised to help customers “Create their Style”. CCI is owned and operated by longtime friends and fellow “dance mom’s”, Deb Blankenship and Michelle Jarvey. Drawing on over 50 years of collective corporate experience and nearly 15 years of performing arts experience - (they have personally applied between 75,000 and 100,000 crystals – EACH - over the years) – Deb and Michelle were determined to lose their corporate suits and heels and do something creative, fun and still challenging. It’s everything and more than they imagined. As we look into the future, we are very excited about the possibilities. We look forward to helping you create new crystal designs, embellish new costumes, re-fashion encore costumes, and finish off a look with stunning hair accessories and jewelry. We love to see the smile on a customer’ face when they leave the store, with the product and tools they need to launch a new project. We hope you enjoy doing business with us. We want to help you express your own personal sense of style and feel free to contact us if you need help/ideas or want to give us feedback. Have fun, don’t hold back – make everything sparkle!